Philips will this year release its range of amBX PC gaming peripherals, the company announced at its European Range 2007 event in Marbella, Spain this week. amBX will provide gamers with a full “sensory surround experience” by empowering game developers to use light, colour, sound, vibration and even airflow during gameplay. 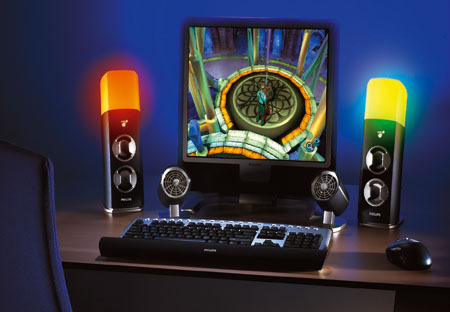 The peripherals include a pair of left and right satellite speaker lights and sub-woofer, a pair of desk fans, a wrist “rumbler”, and a directional wall washer light and controller unit. The left and right satellite LED lights will change colour and intensity depending on what is seen on the monitor. Lighting situations include rapid flashing, from white lightning to red-hot explosions, and more subtle changes in ambient lighting, from a hypnotic fireside flicker to a tranquil blue sky.